Jacques Kallis is the Proteas’ top batsman. The Proteas, South Africa’s national cricket squad, will look to pull off a much better campaign in the upcoming World Cup, and squad selectors say they are confident all the right players have been roped in to take the team to glory. The team will soon head to the Asian sub-continent to battle it out in the International Cricket Council‘s (ICC) one day international (ODI) tournament, which starts on 19 February and ends on 2 April. It will take place at sports grounds in three countries – India, Sri Lanka and Bangladesh. The recently announced final squad comprises 15 players who are all top performers in their respective domestic teams and for the Proteas. “The squad consists of seven specialist batsmen, three specialist spin bowlers and four specialist seamers, with Morne van Wyk providing wicket-keeping cover as well as an extra top-order batting option,” selection convener Andrew Hudson said. Jacques Kallis, a top batsman for the Proteas, has been declared fit to play after suffering a side strain and bruised rib during a test match against India in January. The final result was a draw, but the two centuries Kallis secured earned him the Player of the Test Award. 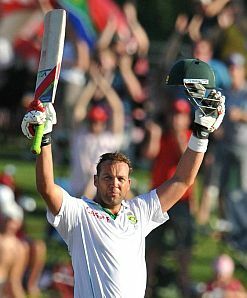 His score of 109 not out in the final match was his 40th test century, while the double century scored in the first test in December 2010 was Kallis’s maiden in a glittering international career spanning 15 years. “Cricket South Africa’s medical committee is happy with Kallis’s progress and he will be ready to play a full role with both bat and ball from the start of the tournament,” Hudson said. The veteran all-rounder nicknamed “The King” is one of seven specialist batsmen who South Africa will look to, to score multiple runs. He will partner with experienced international campaigners like Proteas captain Graeme Smith, as well as Hashim Amla, AB de Villiers and JP Duminy. Left-handed batsman Colin Ingram has made it into the final squad, as well as recent ODI debutant Faf du Plessis. “I am very happy with Faf du Plessis’s debut and form. He gives us a leg-spinning option as well and is an outstanding fielder,” said Hudson. 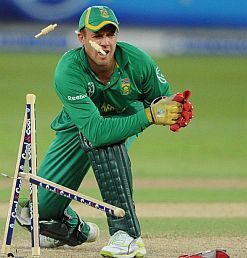 Du Plessis managed to score 60 runs on debut in the third ODI match that South Africa lost by two wickets to India. The ODI series between the two countries is currently under way and will be concluded on 23 January at SuperSport Park in Pretoria. India has won two matches and South Africa one. Pakistan-born cricketer Imran Tahir looks set to be a significant player for South Africa. The Nashua Dolphins champ is now eligible to play for the Proteas after being granted South African citizenship by naturalisation. Tahir, a highly acclaimed spin bowler, has made it into the World Cup squad even though he’s never played an ODI. The leg-spinner, who’s played extensively in England and also featured for Pakistan, is one of the top-ranking bowlers in the South African franchise’s current season. There have been two more specialist spinners added to the team, Proteas T20 captain Johan Botha and Robin Peterson, who will no doubt help keep the opponents’ runs at bay. “The selection of three specialist spin bowlers is essential for the conditions we expect to encounter at the World Cup,” added Hudson. Fast bowler Lonwabo Tsotsobe has been one of the brightest stars of the current ODI series. Taking four wickets for 22 runs against India on 15 January was a career highlight and made him one of only two South African cricketers to ever pull off such a feat. The other was former skipper Shaun Pollock. After such a convincing performance with the ball, it was a disappointment when the Proteas lost the match by a single run. Tsotsobe also took four wickets in the first match of the series, when India was crushed by 135 runs. The lad from Port Elizabeth is one of four fast bowlers who have been selected to increase the fortunes of the Proteas in the World Cup. The evergreen Dale Steyn and Morne Morkel, as well as youngster Wayne Parnell, complete the bowling attack troop. In total, 15 national teams will lock horns in the ICC World Cup, with Zimbabwe and Kenya also representing Africa. Pakistan, Sri Lanka, Bangladesh and India carry the hopes of their fellow citizens on the Asian continent; while Australia, New Zealand, Canada, England, West Indies, Netherlands and Ireland will also offer some tough competition. South Africa will start their campaign on 24 February in New Delhi when they take on the West Indies. After bombing out in the semi-finals in the last ODI World Cup in 2007, the Proteas will be looking to win the tournament for the first time.